Hurricane Irma’s next target for air travel? The world’s busiest airport. The storm is tracking toward Atlanta and other busy airports in the Southeast after making landfall in Florida on Sunday. Irma has already made a mess of flight schedules in Florida, and it began to do the same in Atlanta Monday. Nearly 900 flights had been canceled there on Monday as airlines there braced for Irma, which spawned the first-ever tropical storm warning for Atlanta. 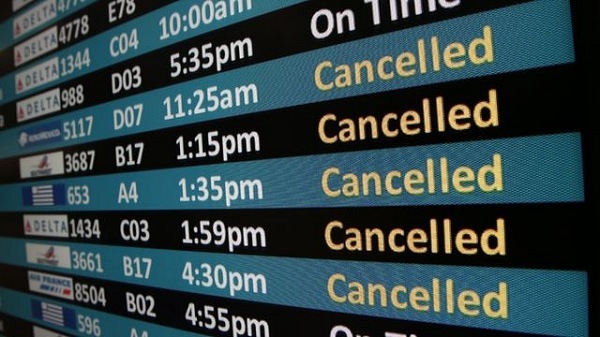 Those cancellations accounted for about a third of the entire day’s schedule there, according to flight-tracking service FlightAware. Atlanta’s airport is the busiest in the world and is home to the largest hub for Delta Air Lines. The carrier has already warned of major disruptions there. “Armed with the latest forecast and hurricane projections, Delta teams in the airline’s Operations and Customer Center have decided to cancel about 800 flights Monday as Hurricane Irma is expected to bring to the Atlanta hub strong crosswinds that exceed operating limits on select mainline and regional aircraft,” Delta said in a statement early Monday.” Aircraft can better handle winds that are with or against them than they can handle crosswinds, the carrier said. Airlines have been busy expanding their change-fee waivers to the north, moving to include airports in across the Southeast as they scrambled keep up with Hurricane Irma’s track inland from Florida . Most airlines already had waivers in place for Caribbean destinations, but they began adding Florida airports to their lists earlier this week. Now those waivers have been expanded as Irma’s track appears certain to take it into the heart of the South. States now included in various rebooking policies range from the Carolinas west through Georgia and into Alabama and Tennessee. Below are links to the specific airline information pages regarding fee waivers.